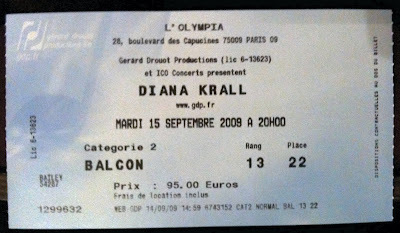 Eight years ago, Diana Krall released her first live DVD Diana Krall - Live in Paris. The two-hour show was recorded live at Olympia Hall on December 1, 2001 and featured the Paris Symphony Orchestra as well as Jeff Hamilton on drums, John Clayton on bass and Anthony Wilson on guitar. Well, now she is back (apparently touring for the first time in five years after marrying Elvis Costello and bearing twin sons), with three nights at Olympia Hall, the oldest music hall in Paris and one of the most famous in the world, rivaling Madison Square Gardens and Carnegie Hall, despite only seating 2000 people. I had two tickets for the first night. Due to Amanda returning to the states to attend to her father's health, Joe, my brother-in-law, took her place. Unlike her live DVD performance, there was no orchestra. Anthony Wilson was still her guitarist, but Benjamin Wolfe was on bass and the drummer was Kareem Wiggins, although it appears that she switches up her bassist and drummer frequently based on the reviews I have read of her other performances on this tour. This could not have been more different than Coldplay 8 days ago (really? it was only 8 days? ), while still being as good as it gets for what it was. -There were 2000, not 50,000, in attendance. -The crowd did not do the wave. -There were no large inflated balls bouncing around the crowd. 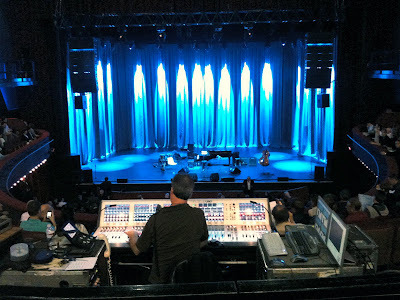 -Diana Krall does not run the stage from side to side while singing, although I was hoping! -She doesn't walk into the middle of the audience to play a set. -She definitely doesn't collapse dramatically from faux exhaustion, although that also would have been a nice touch in her black gown. -There were no large video screens. -Average age of fans (and band?) was maybe 50, not 20. -Clothes were nicer both on the band and the audience. Coldplay was pure music energy. The crowd was electric. Diana Krall was pure music finesse. The crowd was polite but entranced. In tennis terms, it would be Nadal vs Federer. Both are amazing to watch -- Nadal for his aggressive muscularity, Federer for his effortless grace -- but generate different reactions. 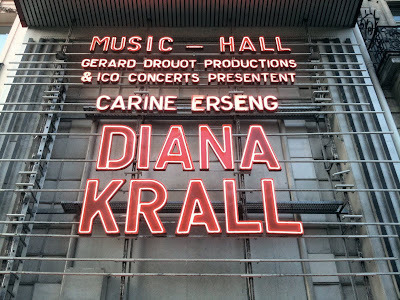 You had the sense that Krall, a contralto, could kick it up a notch if she wanted to be a power diva, but her performance was so nuanced and subdued at times that it pulled you in, forcing your attention to focus on every note, every decibel, every syllable. Coldplay had no problems holding your attention. If Krall was not your cup of tea, I could see someone snoozing or getting perhaps a little bored during her performance. Good luck sleeping through Coldplay. This tour promotes her new album Quiet Nights, which has a dominate bossa nova theme, with several selections written by Tom Jobim. They played for almost 20 minutes before she finally spoke to the audience, introduced her band members (who she frequently deferred credit to) followed by a relaxing piano introduction to "I've Grown Accustomed to His Face." She oftentimes tried to be funny with dry humor that sometimes didn't connect but she was clearly relaxed and it wasn't always clear how much was improvised and how much was actually scripted. Later in the show, she played "I Get Along Without You Very Well"
They were done after 80 minutes but returned for two encore songs, the first of which was "Walk on By"
By the way, the opening act was a quite energetic young French girl named Carine Erseng. She came on at 8p and sang for 30 minutes (with a guitarist and bassist for backup). All her songs were in French as was her conversation with the audience so it was hard to follow but she was still quite fun. 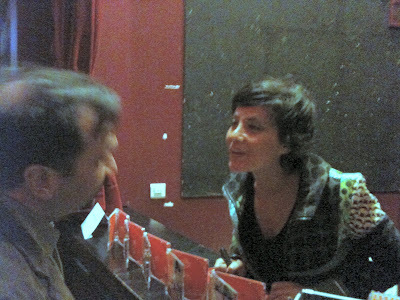 Joe bought her CD afterwards and she was there to sign it enthusiastically. the young singer goes on unabated concerts across France. Never short of energy, ideas and determination, she decided to self-produce her first album. In five years, she has published three albums which sold more than 60,000 copies and are distributed only live at her concerts. If she was a stock, I'd be buying based solely on the force of her personality.